Showing 49 articles from November 4, 2015. LOUISBURG -- Commissioner Art Wright won the rematch with Mayor Elic Senter, unseating the two-term Franklinton mayor on Tuesday night. And a political newcomer in Louisburg elbowed his way onto the town's governing board. Wright and Senter faced off in 2007 when the political newcomer bested Wright for the post. This time, Wright feels he had a more galvanized campaign which led him to victory -- an outcome he wasn't expecting going in. FACES OF THE SEASON. 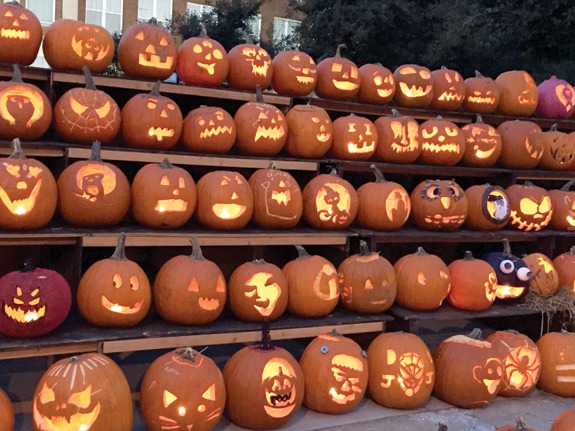 Creativity soared this year at the jack-o'-lantern contest that's part of the annual Frankenfest event in Franklinton. 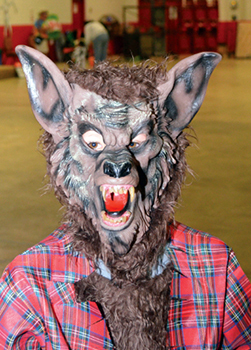 The creations were by area students and were part of the day-long celebration that ended with ghosts, goblins and assorted other creatures "haunting" the town -- and most towns -- across Franklin County. 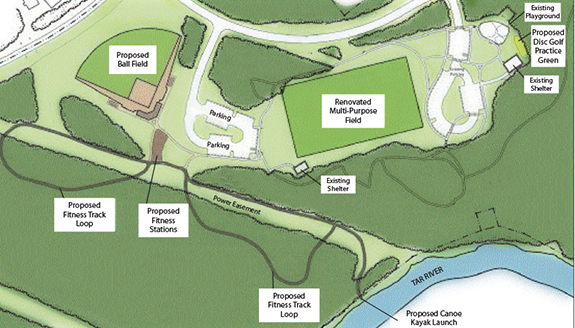 LOUISBURG -- Major improvements are coming to Louisburg's Joyner Park over the next several months, thanks to a joint effort between the town and the state. Last Friday, the state awarded the town about $217,000 in matching money toward a project that was originally targeted at about $500,000. 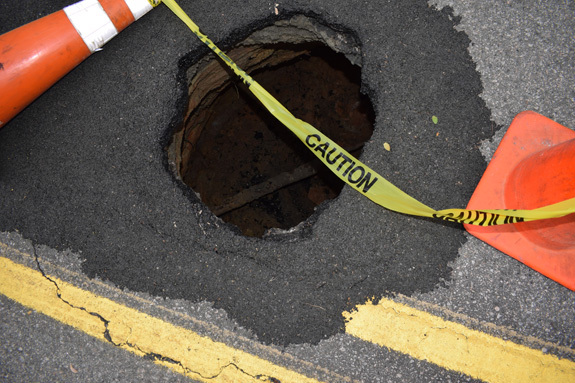 But, according to Louisburg Town Manager Jonathan Franklin, the project can be scaled back enough to get it done for about $435,000 total without adversely affecting the project. Franklin County farmer Jon Pearce (left) received the Conservation Farmer of the Year award last Friday at the annual Farm-City Celebration. Congratulating him are Harrison Marks (center) of Sound Rivers and Tom Gully of the Franklin County Soil and Water District. The award recognizes farmers and farm families who are taking the initiative to implement sound, innovative and cost-effective conservation techniques and are actively involved in conservation education. The winner of the local award competes in the Soil and Water District's Area IV competition and if they win there, they compete at the state level. Bad plot twist: Fred and Asher gone in a week! Losing brothers Asher and Fred Johnson just about a week apart -- and having their funerals exactly a week apart in the same church -- is a plot twist that an experienced novelist might avoid. 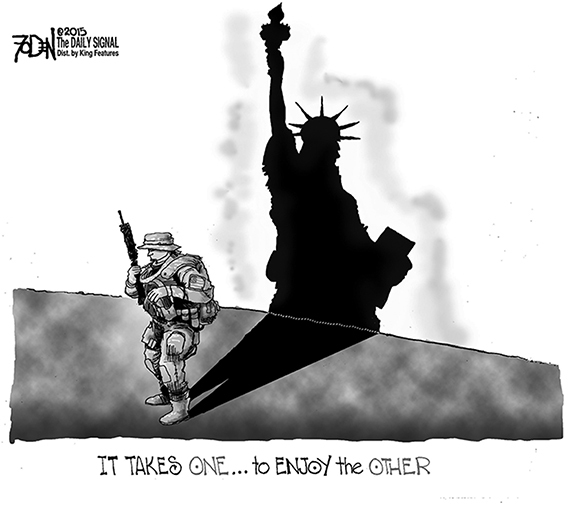 But there is no avoiding the loss the Johnson Clan and the community have experienced. 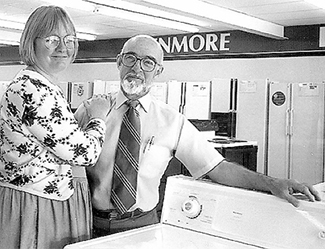 The brothers, who were very close, had long family and personal associations with The Franklin Times over many decades, growing up in the business and playing different roles in it as adults. We hate to be the bearer of "bad" tidings ... but, since you probably read a newspaper to stay informed, perhaps a little warning is permissible. Believe it or not, three weeks from today is Thanksgiving. And just four weeks after that will be Christmas Eve. Of course, we all know what follows a week or so later when we are forced to remember to write a new year -- or apologize for mistakenly writing 2015! The last time I wrote a column about my experience at the Franklin County Board of Commissioners meeting, the chatter was unmistakable. At that meeting, resident Felix Allen raised a number of issues and concerns about the state of county facilities, the lack of business activity in the community and an apparent lack of direction in leadership. It got some folks on the board talking and, as a result, the board has plans to conduct a planning retreat, some time in January, in hopes of addressing some of those matters. The Republicans held their third debate on the campus of the University of Colorado at Boulder on Wednesday, Oct. 28. The facility holds about 1,200 spectators. The students had to complain in order to get their ticket allocation raised to 100. That obscure fact was lost on most, but not me; the Republicans have a problem with people capable of critical thinking. Hours before the debate, Donald Trump was complaining that the moderators would be unfair. At a time when we are living longer, we (Franklin County residents) do not have a hospital, and all of the medical clinics we have depended on for years have closed their doors or are planning to do so with no doctors, no transportation or news of plans to fix it. I was privileged to attend the free panel discussion titled "An Oral History of School Desegregation in Franklin County, North Carolina," on Monday, Oct. 19, in Benson Chapel on the Louisburg College campus. I wish to make a suggestion to Franklin County manager and to our Economic Developer (? ): Why don't you guys ask The Franklin Times for space for a monthly report on your contacts, improvements, monetary catastrophes, probable business industry possibilities, etc. Fred reacting to an Asher story? HOLLISTER - Funeral services for Bernice H. Richardson, 86, who died Monday, Nov. 2, 2015, will be held on Friday, Nov. 6, at 1 p.m. at Pine Chapel Baptist Church in Hollister, with the Rev. Robert Hedgepeth officiating. Burial will follow in Pine Chapel Memorial Garden. 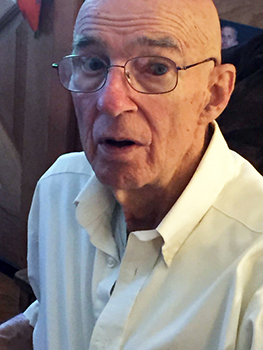 LOUISBURG - Dennis Clifton Mustian, 82, died at his home on October 31, 2015 after a period of declining health problems. He was a life-long resident of Franklin County and was the son of the late Clyde Mustian, Sr. and Lucy Bobbit Mustian. In addition to his parents, he was preceded in death by his brothers, Clyde, Jr., Walter, Forrest; his sisters, Mary Mustian Thomas and Ruth Mustian; two wives Adaleen Harris Mustian and Iva Lyn Shearin Mustian; and his beloved poodle and companion, Molly. WHITAKERS-Funeral services for Lucy P. Lynch, 94, who died Sunday, Nov. 1, 2015, will be held Saturday, Nov. 7, at 2 p.m. at Kingdom Hall of Jehovah's Witnesses, Rocky Mount, with Brother Justin Floyd officiating. Burial will follow in the St. Delight Church cemetery. YOUNGSVILLE - Funeral services for Sarah E. Crews Teasley, 73, who died Sunday, Nov. 1, 2015, will be held at 1 p.m. Saturday, Nov. 7, at Kinches Chapel Christian Church in Franklinton, with the Rev. Willie R. Nixon officiating. Burial will follow in the church cemetery. ZEBULON - Walton Lee Sullivan, 30, died Monday, Nov. 2, 2015 at his home. Graveside service will be held Friday, Nov. 6, at 1 p.m. at the Sullivan family cemetery in Selma, with Pastor David Stacey officiating. LOUISBURG - William Byrd Wilkins, 50, died Saturday, Oct. 31, 2015 at Transitions Life Care in Raleigh. Funeral services will be held at 12 p.m. Saturday, Nov. 7, at Jones Chapel Baptist Church in Louisburg. Burial will follow in the church cemetery. THAT'S A WRAP. 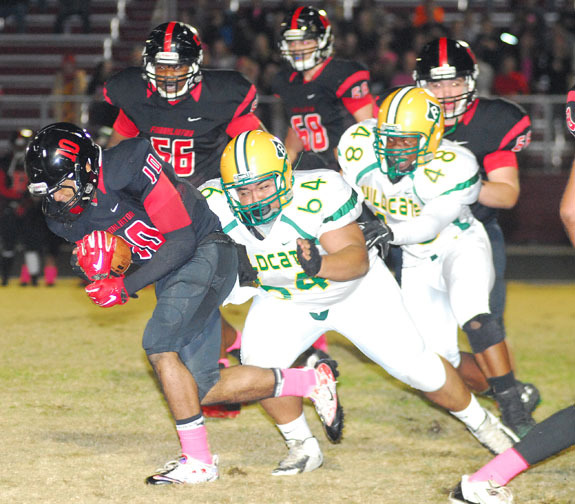 Franklinton running back Tyreese Williams (left) is tackled by Bunn's Omar Rosa during last Friday night's football game. 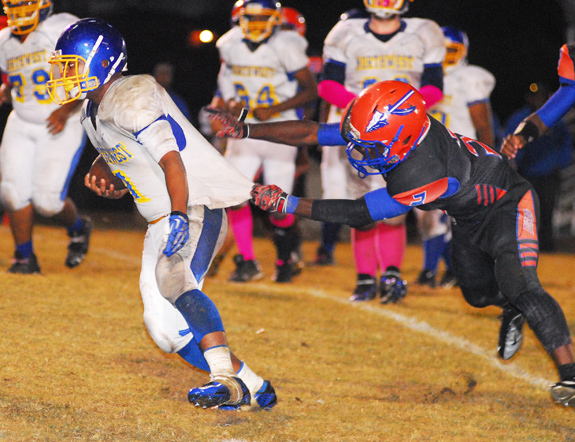 Not only were the visiting Wildcats able to defeat backyard rival Franklinton by a 47-19 margin last Friday, they were also able to remain in the top spot in the Northern Carolina Conference heading into the final week of the regular season. Bunn is now 8-2 overall and 4-0 in the NCC, and Howle can achieve a milestone 200th triumph this Friday at home against Warren County. AIR BALL. Louisburg College's Hannah Rayman (left) controls the ball during last Wednesday's home victory over USC-Salkehatchie in the opening round of the Region X Women's Soccer Tournament. 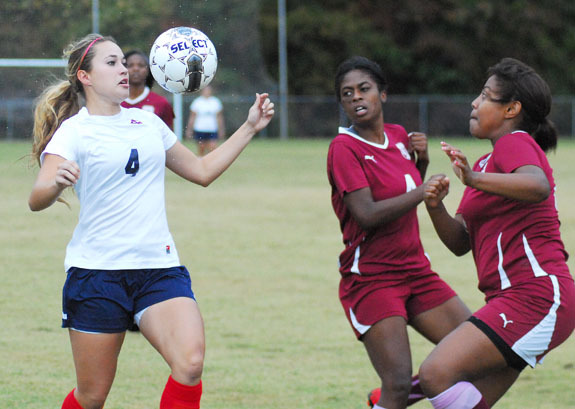 LOUISBURG -- A season of near-misses concluded in appropriate fashion last Saturday for the Louisburg College women's soccer squad. Taking on long-time rival Spartanburg Methodist College, the Lady Hurricanes were defeated 3-2 in overtime last Saturday in the semifinals of the Region X Tournament at Legion Park in Wilmington. The tough-luck defeat ended Louisburg's campaign at 11-6 overall under veteran head coach Andy Stokes. ROAD BLOCK. 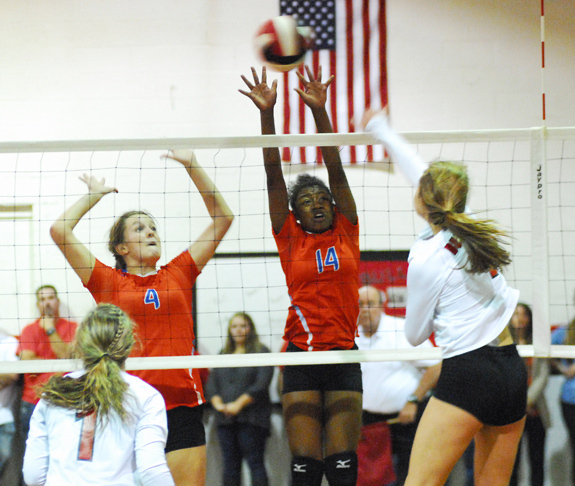 Louisburg's Whitney Bolton (4) and Imari Champion (14) elevate for a block last Saturday versus Roxboro Community. 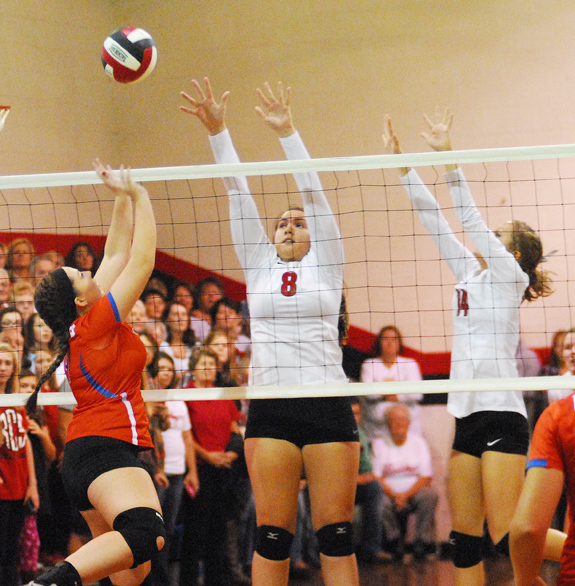 TIMBERLAKE -- After one of its top performances of the season in the Sweet 16, Louisburg found the going a little more sour during its matchup at Roxboro Community School in last Saturday's Elite Eight of the Class 1-A State Volleyball Playoffs. Taking on a solid, touted foe, the Lady Warriors were burdened by several mistakes -- along with quality play from their opponent. The result was a 25-11, 25-12, 25-15 victory in favor of the homestanding Bulldogs. CARY -- Franklinton's budding cross country program under Coach Clennie Wilkins made quite an impact during last Saturday's action at the Class 2-A Mideast Regional Cross Country Championships at WakeMed Park. Both the Lady Rams and Rams fared well at the event, taking fifth place as a team in each race. That number left Franklinton one spot short in the standings of qualifying for the state meet, but FHS showed plenty of promise for the future with its young group. LOUISBURG -- Even after last Saturday's loss to Nassau Community College, Coach Trevor Highfield took a big-picture approach to the season for the Louisburg College football squad. In his first campaign as LC's skipper, Highfield guided the Hurricanes to a 7-1 overall mark. WILMINGTON -- Even though it's almost been a given through the years, Louisburg College's victories at the Region X Men's Soccer Tournament never get old. Louisburg wrapped up yet another region tourney crown on Sunday with a 3-0 triumph over Patrick Henry Community College in the championship match at Legion Field in New Hanover County. Louisburg never trailed after Sam Popp's goal with eight minutes remaining in the opening half of action. LOUISBURG -- Louisburg College is currently accepting nominations for its fourth Athletics Hall of Fame Class. Nominations can be sent to LC Sports Information Director Michelle Carlson. A ceremony to induct the newest class will be held in April on the LC campus. LC Athletic Director Mike Holloman said the school is looking for around eight new members to its prestigious class. JERSEY FOUL. Louisburg's Amonte Moses (right) tackles a Northwest Halifax running back during last Friday night's prep football showdown at Patterson Field. LOUISBURG -- Louisburg High School will feature two new coaches when the Warriors and Lady Warriors kick off their basketball schedules Nov. 24 at home against rival Franklinton. That event will be staged at Taylor Center on the campus of Louisburg College. Chris Baker is taking over the LHS' girls program, while Mike Sheldon is moving from the girls to the boys this winter after leading the Lady Warriors to the Tar-Roanoke Athletic Conference championship in 2014-15. TALLAHASSEE, Fla. - There are no secrets to success according to junior running back Tarik Cohen from Bunn. The North Carolina A&T football team, ranked 20th in FCS football, improved to 7-1 overall and 5-0 in the Mid-Eastern Athletic Conference with a 28-10 win over Florida A&M last Saturday night Bragg Memorial Stadium. 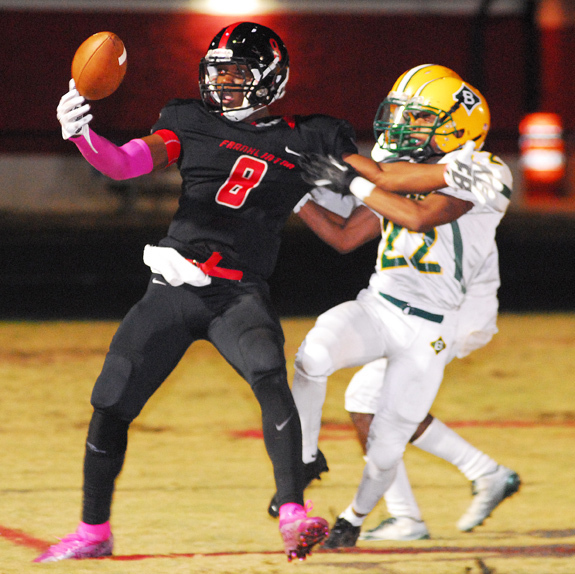 Franklinton's Ricky Person (left) makes a one-handed catch last Friday versus rival Bunn. 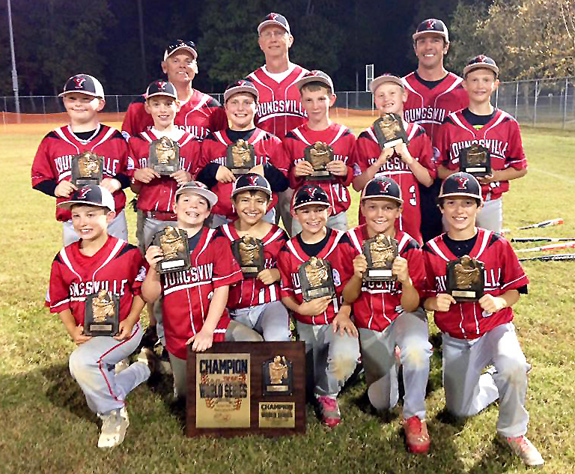 The Youngsville Intimidators 11-Under Travel Baseball Team claimed the Winter World Series Bronze Championship during action on Oct. 24-25 in Tarboro. After participating in pool play, the Intimidators took part in bronze bracket games beginning with a victory over the Carolina Stingers. Youngsville then defeated the Holly Springs Rage 22-7 and the West Raleigh 11-U Select to take the title. 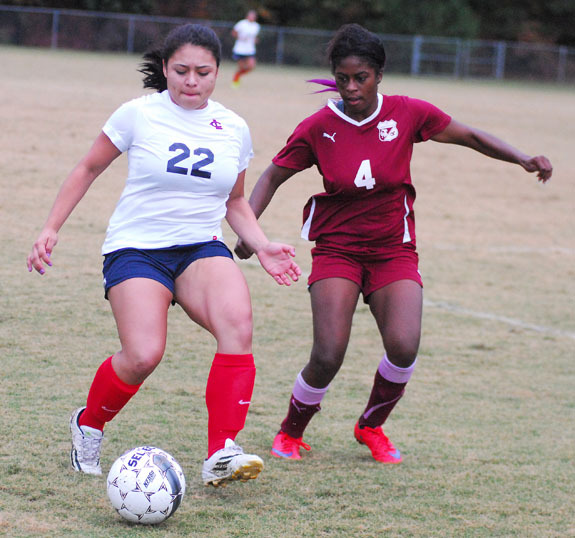 Louisburg College's Yesenia Ascencio from Bunn (left) advances the ball during last Wednesday afternoon's Region X Tournament victory over USC-Salkehatchie at Ronald May Field. Louisburg's Loganne Driver (left) attempts to send a push past the Roxboro Community defense during last Saturday's matchup in the Class 1-A State Volleyball Playoffs at the Helena Elementary School Gymnasium in Person County. 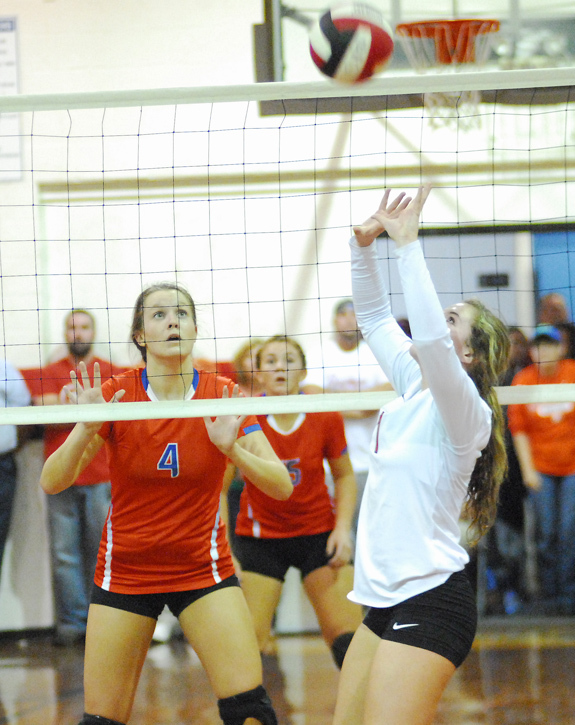 Louisburg's Whitney Bolton (left) anticipates a Roxboro Community School kill attempt during last Saturday's playoff match. Since 1955, the National Farm-City Week Council has supported educational programming to build interdependence between rural and urban citizens, and the President of the United States has annually proclaimed the week leading to and including Thanksgiving Day as National Farm- City Week. Farm-City activities are grassroots in nature. Communities hold Farm-City events ranging from banquets to tours. Classical music fans who heard Joel Fan play at Cherry Hill in 2013 will be delighted to learn that he will return Nov. 15 to the Warren County music venue. 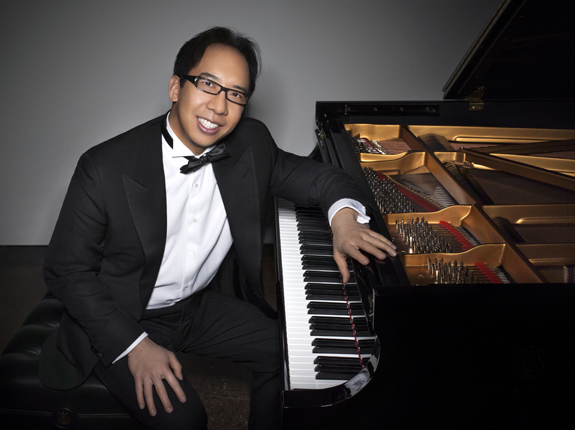 A Steinway Artist, Fan has been acclaimed as an artist with a "probing intellect and a vivid imagination" by the New York Times. He embraces a bold repertoire of piano classics and inspired discoveries of contemporary world music. Fan will play his own transcription of Wagner's Overture to Meistersingers plus music of Brahms and Liszt. Fan, a native New Yorker, studied at the Julliard Pre-College Division before attending Harvard. It could not be easier in Franklin County to find locally sourced foods, whether it is meats, produce, fruits, breads, etc. Where it is at our local Franklin County Farmers Market, based in Louisburg in the Shannon Village Shopping Center, or on-line website, www.FranklinCountyFarmFresh.com, or just word-of-mouth sourcing, it is easy and convenient for you to find local foods. By supporting our local small farmers, it keeps money in our community and supports the economy. The majority of farms in Franklin County are classified as small farms. That is, those with an annual revenue of less than $250,000. During the summer of 2015, a group of farmers joined together and established a local Association to share ideas and help one another succeed. They are a non-profit group, utilizing both sustainable or conventional production, which meets the 3rd Thursday of each month in the evenings to discuss topics related to agriculture. The majority of forest and agricultural lands are owned by women landowners in the United States and Franklin County. Many widows, do not know how to manage their lands or have many questions and concerns regarding their forestlands. Therefore, a series of educational "Lunch & Learn" workshops will be held at the Franklin County Cooperative Extension Center during January and February. The last date in February will conclude with a tour of the new timber buying plant located in Enfield, Klaussner Inc.
Franklin County 4-H'ers have been busy gearing up for different events and competitions. The most recent events and competitions include State 4-H Shooting Sports, showing in the Four County 4-H Livestock Show, and practice and competing at the NC State Fair. Youth from the Franklin County 4-H Sharp Shooters Club competed on the district level in September and qualified to compete on the State level in October. The group brought home many awards. With timber, a good plan is key! This semester at NCSU, I am taking a graduate level course on Forestry. One thing I have learned, "you just don't plant the tree seedling and forget them!" A landowner recently called and said their family had planted an improved stand of loblolly pine trees ... 30 years ago ... and had not touched it... no thinning, no spraying, not a thing whatsoever. 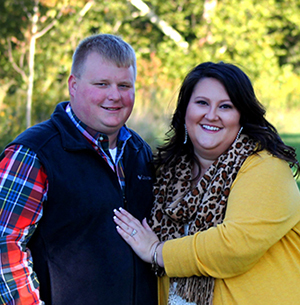 Keith and Connie Cooke of Louisburg announce the engagement of their daughter, Courtney Michelle, to Jonathan Brooks Williams, son of Jim Williams of Lake Royale and Sandra Williams of Louisburg. A June wedding is planned. Kerr Vance Academy in Henderson released their first quarter honor roll. FRANKLINTON -- Police arrested a Franklinton man on gun and drug charges. According to a report by Franklinton Police Sgt. A. Bishop, officers responded to the Speedway gas station the evening of Oct. 31 to investigate a possible drunk driver. Officers spoke with the occupants, including a woman, Barbie Dubois, who had an active warrant for arrest. FOOD NEEDED. A growing worldwide population means increased demands for food, said Dr. Travis Burke, interim director for N.C. 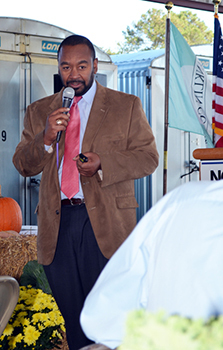 Cooperative Extension, during the annual Farm City luncheon last week at N & N Farms. 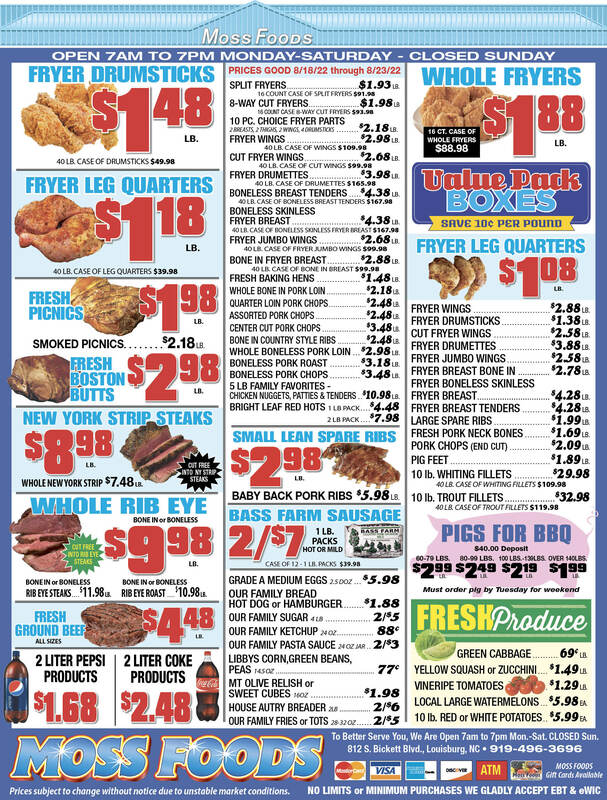 LOUISBURG -- Farm City Week is a chance for those in farming and agriculture to showcase what they do to, essentially, those who might think foodstuffs just magically show up in their grocery store or their restaurant table. It doesn't obviously, say those in the industry. But, looking into their crystal ball, they do know that it will take a bit of pulling a rabbit out of a hat to continue to feed the world's growing population. St-r-a-n-g-e things were happening all around! HIGH TP TOSS! 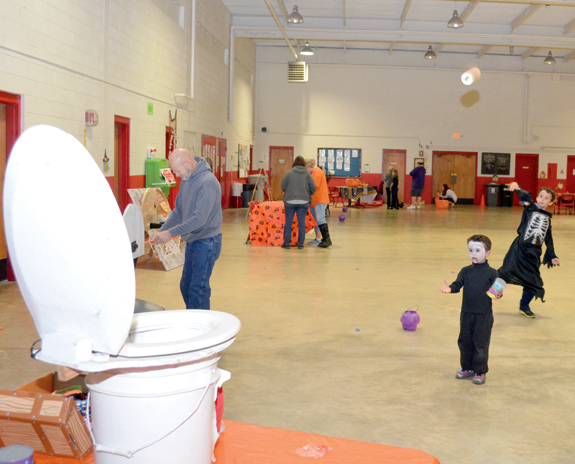 While his younger brother, Dylan, 4, was lining up his shot, Matthew Terry, 8, went for a high lob -- and scored a direct hit in the "toilet" game set up at the Youngsville National Guard Armory by the Kiwanis Club. The boys are from Franklinton. Youngsville and Franklin County officials and staff helped celebrate the grand opening of the Youngsville Animal Hospital with a ribbon cutting. 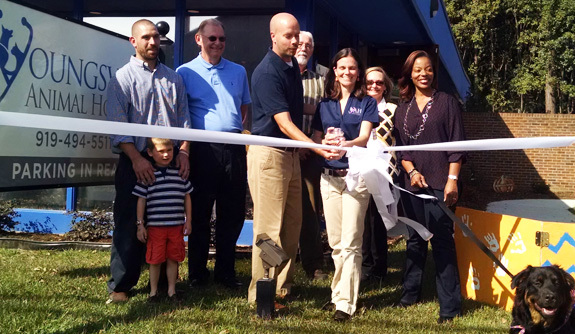 Vet Dr. Miranda Jones-Bailey, center, with Youngsville Mayor Fonzie Flower, center left, cut the ribbon as, from left, Mike Bailey and son, Evan, Town Commissioner Terry Hedlund, Town Manager Bill Tatum, Richie Duncan with Franklin County Economic Development, and Hazel Edmond, program manager with the N.C. Department of Commerce's Building Reuse and Restoration Program, take part in the event.